In conversation with my wife a week ago or so, the subject of sauerbraten entered our discussion. Maybe I was reminiscing about my annual professional society meetings in Chicago when I would go to a German restaurant on the Loop for a meal including sauerbraten. This also jogged my memory about a dorm mate from my freshmen year at Syracuse University, John Hoenig. John entered this discussion because I once visited him during a break to go to a German Club in Rochester, New York. During the visit I dined with his family and was treated to a dinner including sauerbraten. These were fond memories of gustatory pleasure. Unexpected as well as expected pleasures. This story continues. My dear wife over the next few days unknown to me, took the sauerbraten discussion to heart and to my unexpected pleasure she researched a sauerbraten recipe on line and meticulously prepared a heavenly meal including sauerbraten about a week later. 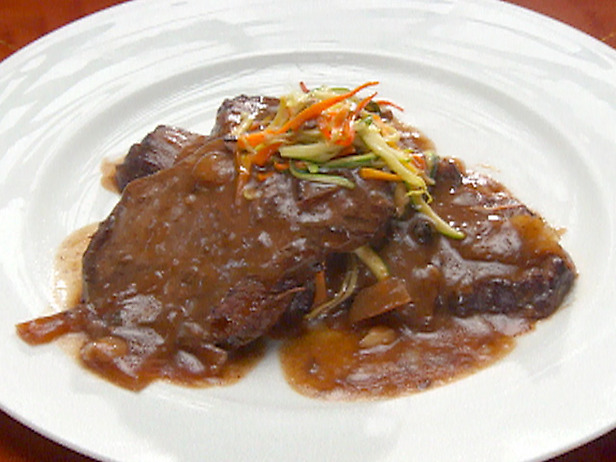 Her sauerbraten dish was certainly much better than any I had had before. Not only was this meal a special gustatory delight, but it was also a celebration of the wonderful devotion and love of my wife of nearly 30 years. Surely I am blessed. Life for me is full of unexpected pleasures!